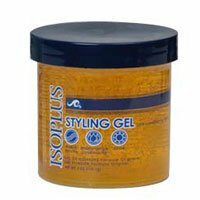 Isoplus Styling Gel applys clean and damp hair. Molding & Sculpting: Isoplus Styling Pre-Conditioning Light Gel. Mold, slick or sculpt hair in desired direction with comb. Smooth hair with back of comb and remove any excess product from hair. Texturized Styling: Saturate clean damp hair with Isoplus Wrap Lotion. Then take generous amount of styling gel in the palm of hand, rub hands together and apply product to hair.